When you’re ready to add a new pet to your household, it can be a very exciting thing for your family. Whether you are seeking a puppy simply as a home companion and an extended part of your fur family, or buying a show dog, not everyone may be pleased. Your current dog may or may not be as excited as you are to have a new housemate. Unless you have made it very clear which human is responsible for all the additonal work that comes with a new puppy, there may be some family feuds about Fideo. Consider the additional cost of food, vet services and training. If you everyone is not fully committed to the welfare and loving care of the new dog, perhaps you need to wait until there is a better time. Kids who have chores, like taking care of the pets, are more responsible and do better in school. 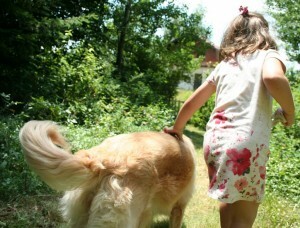 They also develop empathy and kindness by having pets in the home. If you’re bringing home a new dog, you don’t want to just toss the two dogs into the same room and hope they like each other. There are some things you can do to make introductions go more smoothly. For example, make sure that you introduce your dogs to each other in neutral territory. Going on a walk together around the block or even at a local park will work well. Probably not a good idea to have them have a first time play date in the back yard. And don’t force the dogs to interact but instead let them go at their own pace. Dogs will naturally want to sniff each other to get acquainted. Watch both dogs to look for distress. Make sure that you have a person to handle each dog on a leash. Make sure that you are calm to begin with and don’t put a lot of tension on the leash – you want both dogs to feel relaxed and calm. Both dogs should be relaxed and have open mouths. If one or both dogs gets stiff, growls, or bares their teeth you’re likely to have aggression. At that point, separate the dogs and take a break before reintroducing. You’ll also want to keep the dogs separated (crate training works very well) when you’re not home to supervise them. Be very patient because it can take dogs a few weeks to really settle in and feel at home. Once you feel that the two dogs are relaxed and tolerating each other or are even friendly with each other, you can take them home together. At home, you can ease the transition by making sure that each dog has his own food and water bowl and toys. When introducing a new cat, you’ll have a different set of considerations. Cats, in particular, can become very stressed when entering a new home. Work with your dog before you bring a cat home on obedience and being calm. By using clues and cues you can train your dog to remain calm and feel safe. Early training shapes the dog’s personality and consistent, firm and kind discipline is the most effective training for humans or animals. If your dog is calm when the cat comes home, the cat will have less stress and will be less likely to have problems with the dog. When you bring the cat home, place him in a separate room with food, water, and a litter box. Your dog and cat can become more familiar with each other’s scents through the door. Then you can begin to introduce them in the same room keeping your dog on a leash. The dog will want to establish who is boss, but can do so nicely. If your dog is a Labrador you will find they do well in multi-pet households. Provide your dog and cat with their favorite treats when you introduce them, and keep the introduction brief. Eventually, you can leave the door open and let your cat roam. Cats are very good at hiding when they feel threatened. Don’t force your new cat to come out – give him time to get used to the surroundings. And continue to work with your dog on leaving the cat alone so that it can feel safe. When you’re not home, keep your dog and cat separated until you’re sure that the two are comfortable with each other. Eventually your cat and dog may become the best of friends, but at the very least they’ll learn to tolerate each other. After considering all of these factors, you have most likely already made some important decisions about how and when to introduce new pets into your family. This is the one time in life when you really do get to choose your own family. Be sure to claim your free download of Animal Jokes, Riddles & One-Liners at www.ILovePetStories.com It is free when you join our community of kind, thoughtful people who want respect for all. You are free to use this article in your blog, newsletter or handout. Please make sure that author credit goes to Judy Helm Wright, Pet Grief Coach. Check out all the resources available to you at www.deathofmypet.com You will be glad you did.